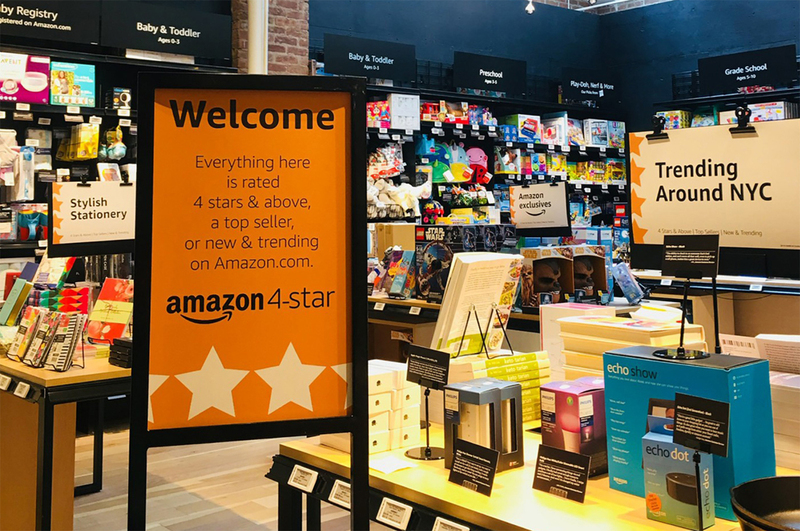 Why it matters: Amazon is again dipping its toes into the traditional retail space it helped to upend with the launch of an experimental new store called Amazon 4-star. It's probably no surprise that the store is cropping up just ahead of the holidays. If successful, expect to see the concept expand rapidly. Amazon is experimenting with a new physical store concept in which it only sells items that have a four-star or higher review, are top sellers or are new and trending on Amazon.com. The storefront is called Amazon 4-star and it opens for business on Thursday in New York’s trendy SoHo neighborhood (72 Spring Street between Crosby and Lafayette Streets, if you’re in the area). Store hours are Monday through Saturday, 10:00 a.m. to 9:00 p.m. and on Sundays from 11:00 a.m. to 8:00 p.m.
Amazon in announcing the retail store said it’ll initially be stocked with popular products in categories ranging from consumer electronics and toys to books, games and kitchen appliances. Collections on display will include Trending Around NYC – products that are hot in the city – and Most-Wished-For which, well, are items most often added to Amazon.com wish lists. Products for sale will even be accompanied by customer review cards featuring snippets from actual customer reviews, a fun little anecdote that Amazon could make uniquely its own. You can also bet that Amazon will prominently display its own line of branded hardware like the Fire TV and its various Echo speakers. It’s also worth noting that Amazon Prime members will only pay the Amazon.com price in store compared to an item’s actual list price (yet another perk of being an Amazon customer).